Autumn is in full swing and I like how the trees are turing red and you can find many varieties of pumpkin. My favorite is the Hokkaido Pumpkin because of its nutty taste, almost like chestnuts. 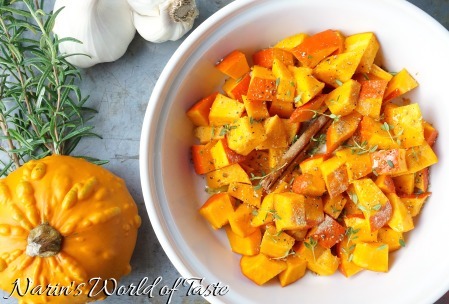 You don’t have to peel off the skin, and you can use it in almost everything, in soups, salads, or purees, and it can be grilled, sautéed, or roasted. Here I created a healthy Hokkaido-Bulgur-Risotto, using bulgur instead of rice because of its health benefits. 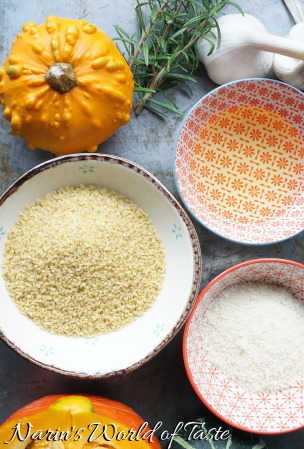 Bulgur is a good source of plant-based protein and very rich in dietary fibre, vitamins, and minerals. The risotto can be served with meat or fish, but also by itself as a meal. 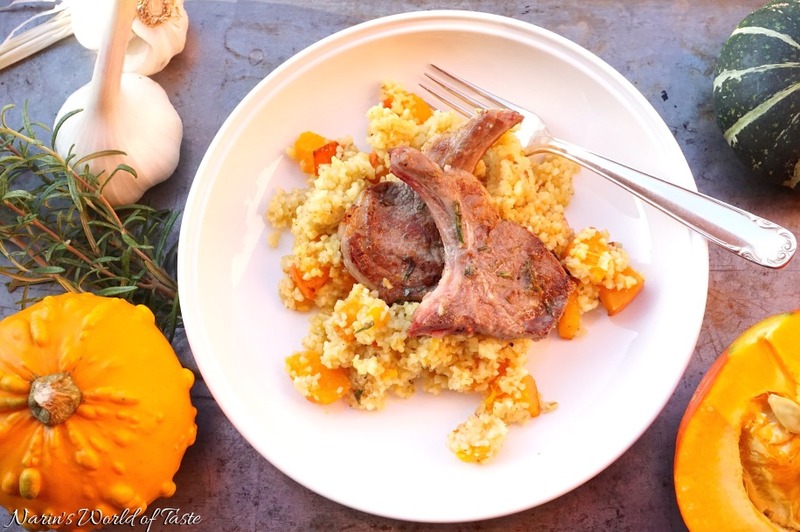 Here I served it with marinated lamb chops, which is one of my favorite combinations. For the marinade, wash and chop the rosemary and crush the garlic. 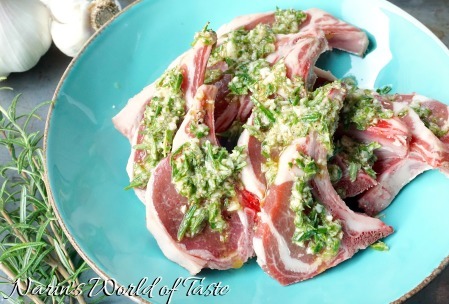 Add all ingredients into a Tupperware and marinate the lamb in it. Leave it in the fridge until needed. You can also do this step a day in advance already. Heat the oven to 200 °C (~ 400 °F). Cut the Hokkaido in half and remove the inner flash and seeds. Wash the Hokkaido halves and cut into 1 cm (~1/2 inch) squares. Add the Hokkaido squares into a casserole and season with the cinnamon stick, thyme leaves, 1 tbsp olive oil, cardamom, salt, and pepper. Combine everything thoroughly and roast in the oven for about 20 minutes until nicely brown and the Hokkaido is soft. Meanwhile prepare the bulgur risotto. In a small pot, warm the broth to medium heat. In another medium sized pot, heat 1 tbsp olive oil and add the bulgur. Stir and deglaze with the white wine or champagne, reduce the heat and simmer until the wine or champagne has completely reduced. Now add the warm broth, about 1/3 of it at a time while stirring continuously until the liquid is almost completely reduced before adding the next part of the broth. The risotto is ready after about 10 minutes when the bulgur is al dente and still has a bit of a chew. Add the grated parmesan and season with salt and pepper. Remove the Hokkaido from the oven and combine it thoroughly with the bulgur risotto. Taste and season with salt & pepper as needed. Heat a grill pan and grill the lamb chops on each side for about 2 minutes. The lamb should be nicely browned on the outside and still red on the inside. Serving: Place a portion of the Hokkaido-Bulgur-Risotto onto a plate. Here I wanted to keep it more casual, but if you have food forming rings, this is a good occasion to use them. 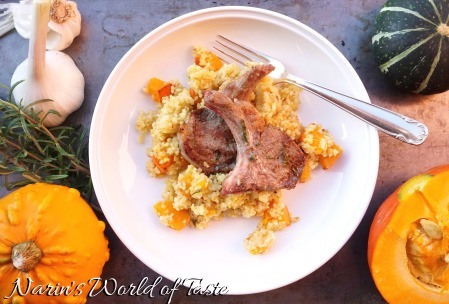 Arrange 2-3 of the lamb chops around the risotto. Serve immediately.